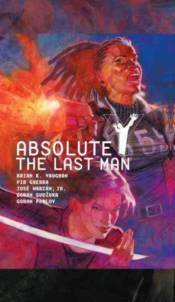 In this second Y: THE LAST MAN Absolute Edition, Yorick's sister, Hero, tracks him to San Francisco, only to find that he has seemingly succumbed to the male-killing plague. Plus, catch up with Yorick's monkey Ampersand and learn the origin of Agent 355. Collects issues #21-40, along with a complete script by Brian K. Vaughan and pencil art from issue #32 by Goran Sudzuka.